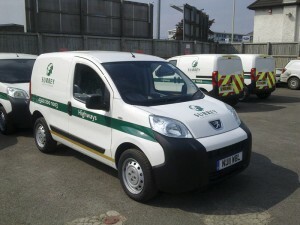 When May Gurney recently took over the term maintenance contract for Surrey, a large number of the county fleet vehicles needed rebranding. As the approved supplier to May Gurney, Rennicks recommended Nikkalite® Crystal Grade (CVF) and Hi SCal sheetings to deliver the correct specification and visual appearance required for the fleet. Nikkalite® Crystal Grade (CVF) and Hi SCal sheeting allowed the correct level of visibility and reflectively required to meet all the standards and the colours could support the brand image perfectly. Rennicks Nikkalite® Crystal Grade (CVF) microprismatic sheeting is extremely flexible and easy to apply, with high visibility properties, ensuring the vehicles are very conspicuous to other road users, particularly in the hours of darkness. Hi-S Cal Fluorescent sheeting provides superior adhesion to both flat and curved substrates with an elasticity and flexibility particularly suited to vehicle applications. Nikkalite® Crystal Grade (CVF) offers excellent reflectively and enhanced recognition in poor visibility whilst Hi-S Cal Fluorescent vinyl’s provide high visual impact; making them ideal for vehicle conspicuity. Speed of application and the quality of the materials used, delivered the desired results in the exacting timescales in order to get the vehicles up and running again quickly and efficiently. The rebrand is now complete to the delight of everyone concerned.